Wei, Jianguo Ji, Yan Zhang, Jingshu Fang, Qiang Lu, Wenhuan Honda, Kiyoshi and Lu, Xugang 2018. Study of articulators’ contribution and compensation during speech by articulatory speech recognition. Multimedia Tools and Applications, Vol. 77, Issue. 14, p. 18849. Ji, Yan Wei, Jianguo Zhang, Jingshu Fang, Qiang Lu, Wenhuan Honda, Kiyoshi and Lu, Xugang 2017. Speech Behavior Analysis by Articulatory Observations. Procedia Computer Science, Vol. 111, Issue. , p. 463. Nabirye, Minah de Schryver, Gilles-Maurice and Verhoeven, Jo 2016. Lusoga (Lutenga). 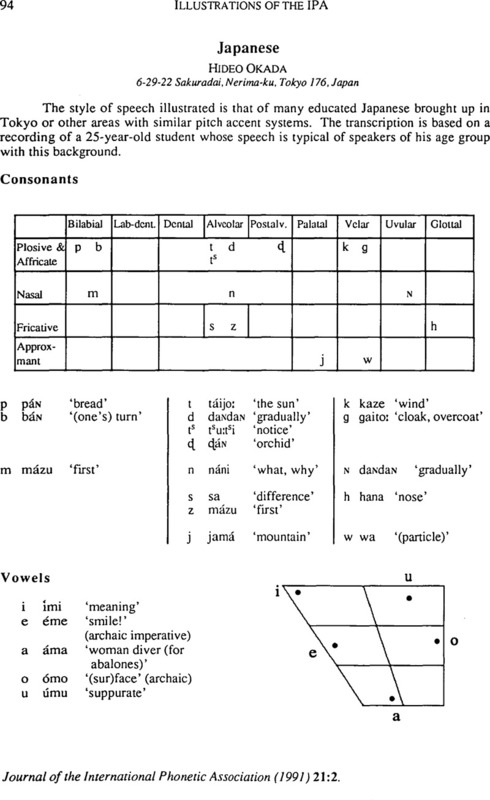 Journal of the International Phonetic Association, Vol. 46, Issue. 02, p. 219. Xijing Luo Jinsong Zhang Zuyan Wang and Hang Wang 2015. Coda's duration on perception of mandarin syllables with alveolar/velar nasal endings by Japanese CSL learners. p. 150. Suied, Clara Agus, Trevor R. Thorpe, Simon J. Mesgarani, Nima and Pressnitzer, Daniel 2014. Auditory gist: Recognition of very short sounds from timbre cues. The Journal of the Acoustical Society of America, Vol. 135, Issue. 3, p. 1380.